4800F Fire Rated 3/4 Electric Strike - fire rated strike at a non-fire rated price. 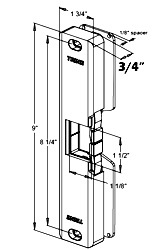 3 Hour fire rated electric strike for use with surface mounted rim exit devices with 3/4" (or greater) throw. For use in new or replacement installations in wood or metal single door frames. Note: The 4800F item number replaces the 4800. You expect fire rating on electric strikes for mortise locks... why not on electric strikes for Rim Panics? For the less than the competitions non-fire rated electric strike, use the Fire Rated 4800F on all your installations. 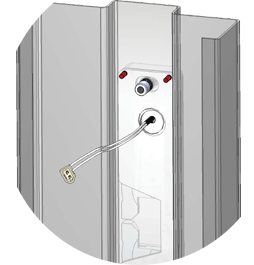 Feel secure in your installs and your specs and take the risk out of needing to install a fire rated electric strike later. For a lower price, why wouldn't you put in a fire rated electric strike? The cavity is completely open -- which means the 4800F allows for a full 3/4" depth and upto a 1" throw with the included two (2) spacer plates -- competitor backplates do not allow for this versatility. Comes with Trines ⇒ Patented 4-Pin Anchoring System. Contains a one piece locking mechanism with one Solenoid -- less parts mean less problems. Fail-safe/Fail-secure - field selectable (Like all electric strikes, it is not fire rated in Fail safe mode). 4800F Electrical Characteristics: "Just Plug and Play"
We supply two (2) 1/8" thick spacer plates in the box for the 4800F fire rated electric strike for those installations that require mounting the strike closer to the panic bar. In addition, the spacer plates can be used as a template during installation. This is especially helpful when installing Trines patented anchoring system. You can order an additional 1/4" Spacer plate with part # 4850-SS or 1/8" Spacer plate with part number 4800-SS. 3/4" thick and an 1/8" spacer plate.